As of version 2.2.0 of the Fluid WP Theme, there is a “Bottom Footer” Widget Area. This area will display under the copyright, and matches the area on the Fluid Fresh Store Builder Template where the Amazon Terms of Service displays. 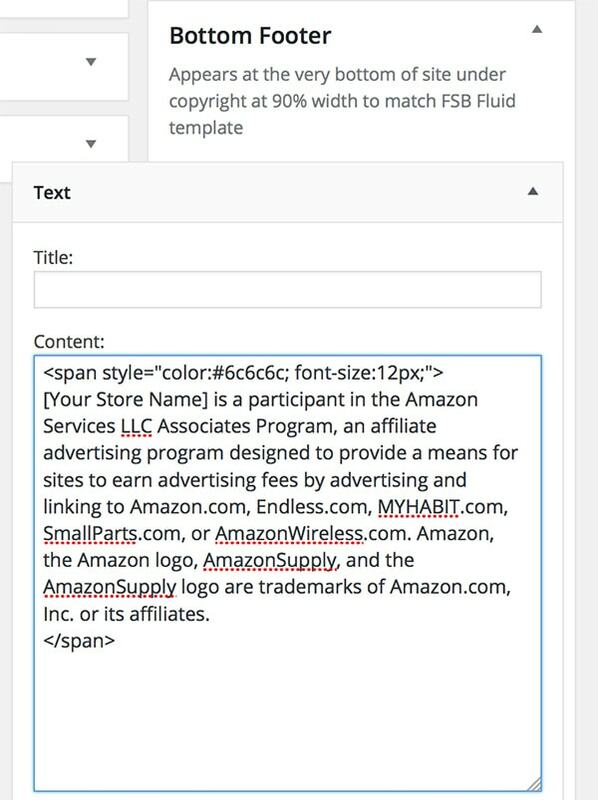 The simplest way to add the Amazon Terms of Service to this area in the Fluid WP Theme is to use a standard Text Widget and copy the text from your FSB store. In order to make it match exactly, you’ll need to add a little CSS code. The default Fluid WP theme uses a font size of 12px and a font color of #6c6c6c when displaying the text. Just remember to close the span at the end of your text. This Bottom Footer Widget area can accept any WordPress widget, so if you want to use it for something else like a banner ad, you can do that also!